You Can't Eat Your House. Or Can You? You Can’t Eat Your House. Or Can You? The purpose of my recent absence was to look into a Continuing Care Retirement Community (CCRC) for my aging mom. In a CCRC, residents start with independent living, and as their need for assistance progresses, they will receive increasing levels of care, from assisted living to skilled nursing care. The cost of course is part of the decision, along with the quality of the facilities and the services. My mom retired many years ago. So far her monthly social insurance covered all her expenses. As a result, her savings had actually grown. If she goes into a CCRC, however, her expenses will exceed her monthly social insurance plus the income generated by her savings. She didn’t like dipping into the principal of her savings. She’d like to keep a reserve in case she needs expensive long term care for an extended period of time. So she thought she couldn’t afford the CCRC. However, only looking at her social insurance and tinkering with her savings misses a much larger asset. The value of her home is worth several times more than her savings. This is very common. You must have seen reports on how people didn’t have enough saved in their retirement accounts. Those numbers don’t include home equity. Many people have home equity worth several times more than their liquid savings. Selling the home and becoming a renter is an option theoretically but my mom doesn’t want to do it. After having her own place for many years she doesn’t want to be subjected to the whim of a landlord. Selling and moving to a different city where homes are less expensive also gives her stress she doesn’t need at her age. If the CCRC doesn’t work out, she’d like to return to her own home, where she feels safe and familiar. She sees her home as her roots. She doesn’t want to cut off her roots. I don’t blame her. Still, the value of her home can be unlocked to provide additional money for her spending through a reverse mortgage. In a reverse mortgage, the homeowner receives money from a bank as a loan, on which the bank charges interest. The loan balance increases over time and accrues against the home. After the borrower dies, the proceeds from selling the home will pay off the loan with interest. Before understanding the reverse mortgage, my mom thought her home only provided a place for her to live. How much the home is worth made no difference to her. She said “It’s just a number. You can’t eat your house.” After I explained it to her, she feels much more at ease in spending from her savings. She knows even if she exhausts all her savings, she still has much more spending power from tapping the home equity. She doesn’t have to actually use the reverse mortgage. Just the possibility of using it gives her peace of mind. One common misunderstanding about the reverse mortgage is that the bank will get the home on the cheap after the borrower dies. Some people also think the bank will get all of the home’s future appreciation. Neither is true. Whatever amount is loaned, with interest, is still just a loan. The bank doesn’t get 100% of the value of the home. Whatever value the home appreciates to belongs to the homeowner. After paying off the accrued loan balance, the remainder still goes to the heirs. It’s true if my mom uses a reverse mortgage, her heirs won’t be able to inherit 100% of the value of the home. I told Mom the home is first and foremost her asset. It should be used for her benefit. She should not feel obliged to preserve the home for inheritance while limiting her own spending to her social insurance and her cash savings. If the heirs want to inherit the home unencumbered, they can fund mom in the same way the bank does. They will be paid back when they inherit the home. This way the heirs will effectively earn all the interest and fees the bank would charge, tax free. Many older residents in the San Francisco Bay Area, where I live, are also sitting on large home equity. The modest homes they bought years ago for $100k are now worth over $1 million and in some cases over $2 million or $3 million. Their paid-off home is a huge asset that can be unleashed for their retirement. In the early years of retirement they can just sell and move. In the late years if they feel like staying put they can get a reverse mortgage for additional spending. A reverse mortgage isn’t the only way to use the home equity for cash spending. If the homeowner’s income can qualify, they can also get a regular HELOC or a cash-out refinance. The point is they shouldn’t feel constrained to their Social Security and cash investments while they sit on large home equity. 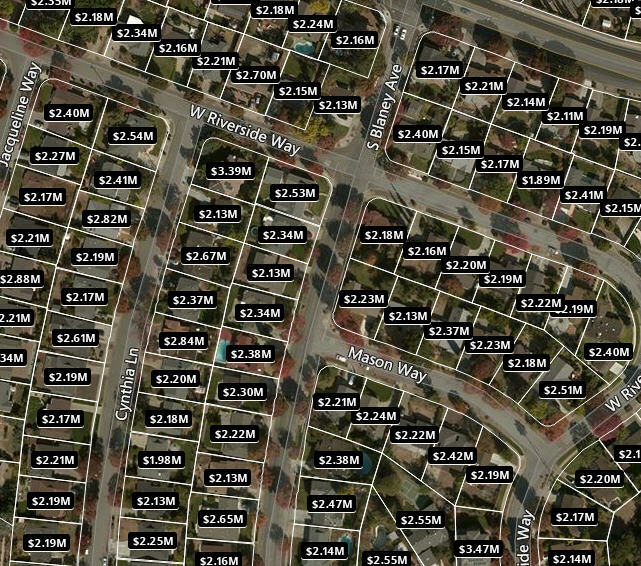 The image below shows home value estimates in a neighborhood not too far from where I live. These homes were built in the 1950s. Most of them are under 1,500 square feet. Some are under 1,200 square feet. Now they are all worth over $2 million. If anything, the estimates shown may be too low. That $1.98 million one in the bottom left sold for $2.5 million two months ago. Sometimes I see people ask whether the equity of their primary residence should be included in their net worth. The answer is absolutely yes. If you have $2 million in home equity, even if you stay put, you don’t have to limit your spending to Social Security plus safe withdrawals from your liquid portfolio. That’s the difference. You can eat your house. Very nice article on a subject most know little about because of the bad press in years gone by. I grew up 2.8 miles away from your screen shot! I went to church 0.2 miles away from your screen shot. I marvel at the magnitude of the home equity lottery that your mother, my parents, and my former neighbors have won. Relative to home prices nation-wide, those living in the bay area are sitting on gold mines of home equity. While I’m happy for them, I worry about those living outside of the bay area bubble who have relatively meager home equity combined with very meager liquid savings. It’s in the form of a home equity line of credit (HELOC). One of several versions of a reverse mortgage . The big difference between that and a traditional HELOC is that we never have to pay it back when we living as long as one of us is living in hall cleaning we intend to move back in our home. And there’s no monthly payment. One big , and not always recognized, catches to a reverse mortgage is there’s a closing cost. It’s sort of hidden because it doesn’t come out of your pocket directly. Large. We essentially essentially got lenders ti bid against each other on closing costs for our reverse mortgage. What started out as $16,000 in closing cost we got down to $1200. If I remember right they didn’t explicitly lower the closing cost but “offered to cover it out of some kind of ‘promotion. ” I didn’t care what they called it I just knew I was saving damn near $16,000. Ours was with BofA. They later sold our HELOC to another entity, but it didn’t change our terms . Great suggestion about the kids becoming the bank. The kids can also purchase Mom and Dad’s home with the parents carrying the mortgage and renting it back from the kids. Hi Harry – Best to your mom. Yes, it’s been quite a ride here in the Bay Area. I took some chips off the table in 2017 and have some regret, but I do appreciate more the peace of mind and flexibility. I’m happy for the folks in CA who have great home equity gains. I lived in NoCal and SoCal and am one of those who departed for cheaper, easier areas (longer story significantly shortened). I now live in a 4700 s.f. newer home that I bought with cash. Our neighborhood has a beautiful pool, tennis courts, a new rec area, wonderful landscaping, and my annual homeowners fee for it all is $1,000. Hasn’t gone up in 15 years. The traffic nightmares are a thing of the past, and I’ve made many new friends. I’m also just 25 mins from a major city so the culture (shows, restaurants, public gardens) is even more easily accessible than before. I share this not to denigrate California, or any other state. California is a physically beautiful state; 2nd in my mind only to Hawaii (though Alaska is right there in the mix). But the traffic, congestion, homeless, taxes, and overall cost of living outweighed the positives for me. My current home is only worth 1/3 of those in the neighborhood posted in Harry’s article, but I’m living an easier and more enjoyable life here. It’s obviously not for everyone, but relocating isn’t as scary as you might think. My grandmother wanted to live in her home until she passed. We were able to accommodate her wishes through a reverse mortgage even when she needed live in caregivers 24/7. She lived to over 100 years and was in that home for nearly 70 of those years. After she passed and the home was sold and BofA was repaid there was still moneys left for the six heirs listed. I am so thankful for the reverse mortgage option so I could keep her in her own home as first dad and then I promised her. Did your mom actually take out a reverse mortgage in case she eventually needs it? Or did you just reassure her that it’s an option? Curious because some (e.g., Pfau) advocate opening a reverse mortgage early on in retirement so that the allowable loan amount can grow with interest. I also though that you had to be in the home while you have a reverse mortgage? I’m not an expert in this area, so any thoughts are appreciated. I only pointed to her it’s an option. Just knowing that option exists made her more comfortable with spending her cash savings. Whether one should open the reverse mortgage line early or late, or whether a regular HELOC or cash-out refinance works better, or whether the kids can act as the bank, will depend on the individual circumstances. I am just starting to think about this. The basic issue is how much a hedge would cost on an ongoing basis. About 10 years ago futures contracts based on S&P/Case-Shiller housing indexes were launched on the Chicago Mercantile Exchange. They have contracts to track 10 metropolitan markets – Boston, Chicago, Denver, Las Vegas, Los Angeles, Miami, New York, San Diego, San Francisco and Washington, D.C. (as well as a U.S. composite). The article gives an estimate of the cost to hedge a $500,000 (!!) Wine country house but I need to study it. Don’t bet your home on an article about hedging your house, written in 2008 at the height of the housing crisis. Hedges are for professionals and not for normal investors. It is just a way to lose a lot of money needlessly. Hedge your home by living in it and keeping it in good shape – a roof over your head is priceless in bad times, especially if it is paid for, which it eventually should be if you stay in one place long enough. Put the money you save in a low cost total stock market index fund and in 40 years it will be worth way more than your house . If an elderly parent decides to keep their home, make sure the kids are a good support system for that decision. Home maintenance alone is very expensive on an older home. New roof, furnace, air conditioner, etc. can be tough on your kid’s budget. We shared the costs, dividing the bills three ways, on the mechanical and kitchen appliances. But a new roof required my mom to get a reverse mortgage. Closing costs were high. And they required mortgage insurance as well. It was fortunate that interest rates were low during that time period otherwise the interest alone would have significantly eaten into the reverse mortgage balance. Cleaning out my mom’s house for sale took 6 months including auctioning off her household things she no longer needed…. and we had several repairs that needed to be done before putting the house up for sale. It consumed all our free time during that period. Just want you to be aware. After paying off the reverse mortgage balance, she had about $30K left. I would only recommend a reverse mortgage as a LAST resort. “Hidden Costs” of a reverse mortgage and the decision to stay in an older home. Did you read my earlier post…where I mentioned that I was able to essentially get lenders to bid against each other in closing costs? That what started out as well over $12,000 in closing costs I got down to about $1200, and they paid for the appraisal too? Yes , I did see your comment that you were able to negotiate the closing costs. Unfortunately, my brother didn’t involve the rest of us when he signed my mom up for a reverse mortgage, or I would have tried to do that. If she is going to be staying in the CCRC, why not rent out her home? My father recently passed and I and my siblings discovered that their finances were a house of cards. The house has a reverse mortgage that was originated for a lump sum 8 or 9 years ago. Right about the time of his passing we sussed it out and the loan balance has accrued interest such that the total debt is equal to the fair market value. I think the lending terms were such that you could borrow 60% of the value at the time of the loan or something like that. The fact that they took the lump sum versus the annuity contributes to the pickle my mother is now in. With the home fully tapped and all other assets consumed my mother is now in the spot of potentially supporting the expenses of the home with just one social security check. These expenses are lumpy but smoothed out, taxes, utilities, condo fees, insurance are about $1,400 a month. Admittedly not that different from rent in the area, with maintenance risks. The net from the social security check is like $1,700 (down from 2,500 when there were two checks, net medicare). We, the kids, can see this isn’t sustainable long term. The question is will one of us move in with her, will one of us take her in, or will we all supplement her and let her continue to live there. The point of my comment is to illustrate that while you might be able to eat your house, the meal is finite if you take the lump sum and not the annuity. I am sure the fees on the annuity are as bad as the loan terms, so that is something to keep in mind also. D, sorry for your loss. If the choice now or later is “one of you will take her in or move in with her” and the house is still in good shape, then I would think the math, at least, would favor someone moving in with her, in which case your “combined” expenses go down rather than up and you are there to give assistance when needed. If it affords you being able to sell your house, or rent it out, so much the better. If your mom is capable of living on her own, paying $200-$250/month each to let her continue to leave there (it is a bit cheaper for just one person than two) is certainly going to be both the easiest and most fair solution. Great blog, thanks. Reverse mortgages are fraught with issues, something that I would personally stay away from. Downsizing is the first thing people do and its probably the more sensible approach. The best approach of course is to plan well ahead, starting in your early working years, so you have the power of time behind you. An HECM loan must be paid off, not only when the borrower dies, but also when s/he permanently moves out of the home. And any situation in which the borrower lives someplace else for a majority of the year or for more than 12 consecutive months for medical reasons  including a nursing home or assisted living  counts as a permanent move that triggers the repayment obligation. I just thought I’d point out that your mother can’t take out an HECM to fund the cost of the CCRC if and when her savings are depleted; at that point, she would have to either sell her home or move back into it (although, if she did move back into it, she could take out a reverse mortgage at that time to help pay for the cost of any care she may require). Thank you Gayle for that note. If she likes the CCRC she would just sell her home. She’s concerned if she doesn’t like it after some time she wouldn’t be able to come home. With a reverse mortgage as an option, she can return to her home and hire home care aides. Harry, since you mentioned CCRCs, I’m wondering if you plan a future column on their financial aspects? I still know too little about them. I’d love to learn more. EEKS! I think of reverse mortgages as an absolutely last resort. After getting debt free, I wouldn’t want to get back into debt. Especially as a senior, when the thinking can be muddled, the process confusing, and the ramifications unclear. The reverse mortgage allows an elder to stay in the home, possibly with a caregiver (if needed), and not relocate. Right? Or at least, not relocate until the reverse mortgage comes due. If she’s youngish, like in her 60’s, she MAY live 30 years. Then what? If she’s already considering moving to another location/care facility, why not rent the house out? The cash flow on a house like that would be huge, and you’re generating income instead of debt. She keeps her options open and should have plenty of funds for the ever increasing costs of a board and care facility. You could do a fairly short term lease, furnished, and see if it works out at the care facility. Maybe a short term rental such as AirBnB or a corporate rental, which get top dollar. Another option would be to pull out equity (cash out re-fi) and use that cash to earn. Maybe a small rental, a private secured Trust Deed loan, etc. If it were me, I’d get a rental, because of the good cash flow potential. Then she’d have an income stream AND a home. You’re missing the advantage of a reverse mortgage in that strategy: A conventional re-fi (HELOC) would REQUIRE her to make monthly repayments on it. That’s not optional. So if, for example, the investment rental wasn’t working out as hoped she could get squeezed badly. If she got a line of credit on a reverse mortgage (it’s just a HELOC that you never HAVE to make repayments on) it’s safer. And probably a lower interest rate than a conventional refi. And with a reverse mortgage you STILL own the home. Only downside to watch out for IMO is a reverse mortgage can have a very high upfront (but hidden) closing cost.